Tag your study abroad photos with #AugsburgCGEE to enter! The spring 2016 semester programs in Mexico, Central America, and Southern Africa will be hosting an Instagram photo contest from January 20 – May 20, 2016. 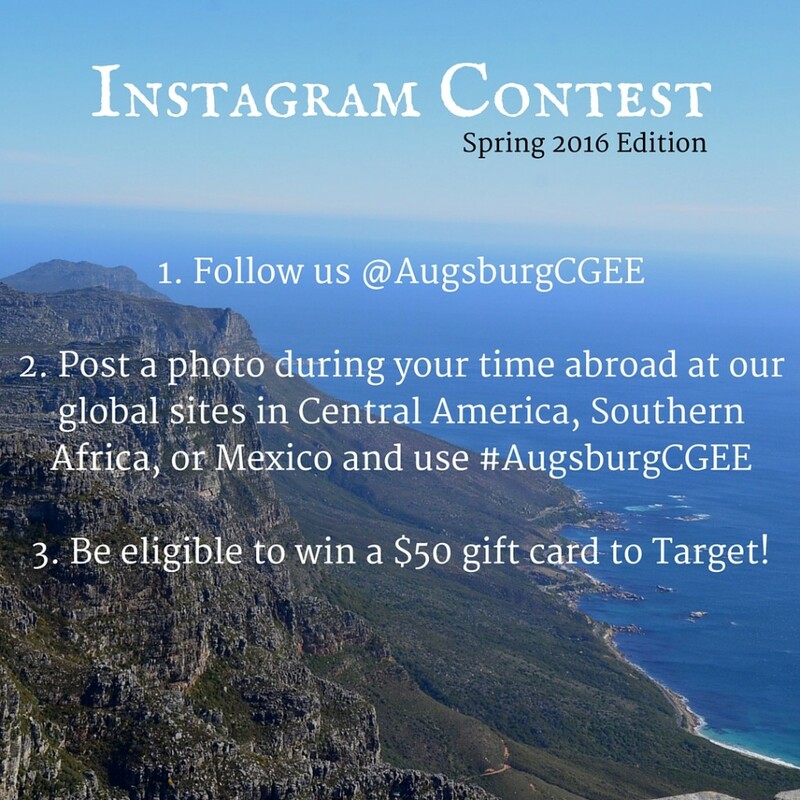 Post a photo on Instagram with #AugsburgCGEE between January 20 – May 20, 2016. Friends of our Facebook page will be able to vote on their favorite submissions by “liking” the photos during the voting period May 23 – 30. Photo with the most “likes” will be chosen as the winner on May 31st. Please keep your photos appropriate to all audiences. We reserve the right to deny entrance to the contest for photos with profanity/obscenity/etc. If your Instagram account is private, we may not be able to view your photos so please let us know your Instagram user name. We will only view photos tagged with the contest hashtag #AugsburgCGEE. Email Lucy Hardaker at hardaker@augsburg.edu with questions regarding the contest. This promotion is in no way sponsored, endorsed, or administered by, or associated with, Instagram. You are providing your information to Augsburg Center for Global Education and Experience and not to Instagram. ELIGIBILITY: This contest is open to all by Augsburg Center for Global Education and Experience Instagram followers who are 18 years of age or older at the time of entry and live in the United States of America. Employees of Augsburg Center for Global Education and Experience (the Sponsor) its affiliates, subsidiaries, advertising, promotion and internet agencies and their immediate family members and/or those living in the same household of each are not eligible. Void where prohibited by law. All federal, state, and local laws and regulations apply to these sweepstakes, contests/promotions. If you cannot or will not comply with these Official Rules, you should not participate in the sweepstakes. By entering this Sweepstakes, you agree to be bound by these Official Rules and to waive any right to claim any ambiguity or error in these Official Rules or the Sweepstakes itself. You also agree to be bound by all decisions of the Sponsor or its designees, whose decisions are final and binding. By entering the contest, you agree to release the Sweepstakes Entities, and Facebook and Twitter from all responsibility or liability for damages, losses or injuries of any kind resulting from participation in the Sweepstakes or any prize-related activities, if any, or any awarding, possession, use and/or misuse of prize(s), if any, awarded herein. This promotion is in no way sponsored, endorsed or administered by, or associated with, Facebook or Twitter. You are providing your information to Augsburg Center for Global Education and Experience and not to Facebook or Twitter. There is no cash alternative to the prize. Odds of winning depend upon the number of eligible entries received. HOW TO ENTER: Beginning January 20, 2016 at 9:00am CST follow the instructions to enter the competition by following @AugsburgCGEE on Instagram. Entrants must snap a photo of themselves, tag @AugsburgCGEE and use the official contest hashtag #AugsburgCGEE in order to be eligible. Entrants must enter before 12:00pm on May 20, 2016 in order to be eligible to win the prize. Entries received after this date and time will not be included in the selection process. Only followers of @AugsburgCGEE on Instagram will be eligible to win. Please note, this is a global competition and is not site specific, therefore only one winner will be chosen globally. The winner will be announced via the official @AugsburgCGEE Instagram and will be directed to email hardaker@augsburg.edu in order to collect their prize. The winner will be selected by Friends/Fans of the Augsburg Center for Global Education and Experience Facebook Page, who reserves to right the judge which photo is the winning submission. The decisions of Augsburg Center for Global Education and Experience are final on all matters relating to this competition. Odds of winning will depend upon the number of eligible entries received. The winner will be notified by the official @AugsburgCGEE Instagram within 1 day of the voting period ending May 30, 2016. If the winner cannot be contacted within 3 days another will be chosen. The prize is not transferable and there is no cash alternative. GENERAL RULES: No Purchase Necessary. Buying Will Not Help You Win. Your chances of winning without making a purchase are the same as the chances of someone who purchases something. It is illegal to give any advantage to buyers in this competition. Entrants agree to abide by the terms of these official rules and by the decisions of Sponsor, which are final and binding on all matters pertaining to this Augsburg Center for Global Education and Experience Competition. Non-compliance within this time period may result in disqualification and selection of an alternate winner. Return of any prize notification as undeliverable may result in disqualification and selection of an alternate winner. Entrants further grant to Sponsor the right to use and publish their Instagram handle and photo submission in print, and in any other media in connection with this Augsburg Center for Global Education and Experience Competition. With image submission to @AugsburCGEE from January 20 – May 20, 2016, entrant grants Augsburg Center for Global Education and Experience royalty-free license to display, retain and modify all images submitted. All images will be credited with the name of entrant. Acceptance of a prize constitutes permission for Sponsor to use winner’s name, photos and likeness for advertising and promotional purposes without additional compensation unless prohibited by law. No substitution or transfer of prize by winner permitted, except that Sponsor reserves the right to substitute a prize of equal or greater value in the event that the advertised prize is unavailable. All applicable income taxes are the sole responsibility of winner. By entering, entrants and their respective parents or legal guardians release, discharge and hold harmless Sponsor, its subsidiaries, affiliates, directors, officers, employees, and agents from any and all liability or any injuries, loss, or damage of any kind arising from or in connection with this competition or any prize won. By participating in this promotion, entrants and their respective parents or legal guardians agree to be bound by these Official Rules and the judges’ decisions, which are final. In the event there is a discrepancy or inconsistency between disclosures or other statements contained in these competition materials and the terms and conditions of these Official Rules, the Official Rules shall prevail, govern and control. All material submitted becomes the sole property of Sponsor and will not be returned. Sponsor is not responsible for any typographical or other error in the printing of the offer or in the announcement of the prize.